So here they are: the first Espresso Italiano Trainers are ready. Twelve professional coffee tasters who are now qualified to give seminars on behalf of the International Institute of Coffee Tasters. Twelve new ambassadors of our association who all share the same aim: to raise awareness about the culture of the true Italian espresso. They are now ready to popularize espresso coffee culture through a new seminar entitled “Espresso Italiano Experience”, a teaching format which enables participants to learn the basics of espresso tasting. Participants will discover how to distinguish a top quality espresso from the growing numbers of poor quality cups now available on the market. This offensive against bad coffee will not just be restricted to Italy: three of the twelve new Espresso Italiano Trainers will be operating abroad in the United States, Slovakia and Denmark. And, meanwhile, the first Japanese Espresso Italiano Trainers have also just qualified. We shall be giving further details about this in the near future. The following are our new Espresso Italiano Trainers: Alfonso Paolone, Melania Lopez, Vittorio Ventura, Giovanni Ferraro, Remo Poli, Adolfo Vallini, Virgilio Lanzanova, Dario Manazza, Gennaro Buono, Massimo Pallard, Paolo Scimone and Sebastiano Garbellini. We all knew the International Institute of Coffee Tasters was landed in China. 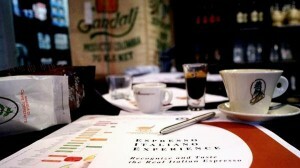 We held the first Espresso Italiano Tasting courses in Guangzhou and Beijing in December 2010. Thanks to our member of the board Darcy Sun, from March of this year, our manual Espresso Italiano Tasting is also available in Chinese. Furthermore we organized in July a new series of training courses and seminaries. Now we are back again in Guangzhou where the International Institute of Coffee Tasters together with the Italian Espresso National Institute has patronaged a new edition of Caffè Italia. So, after the editions in 2010 held in Tokyo, New York and Paris and the 2011 Tokyo one, a new building block is added to the plan of spreading the real Italian espresso culture. 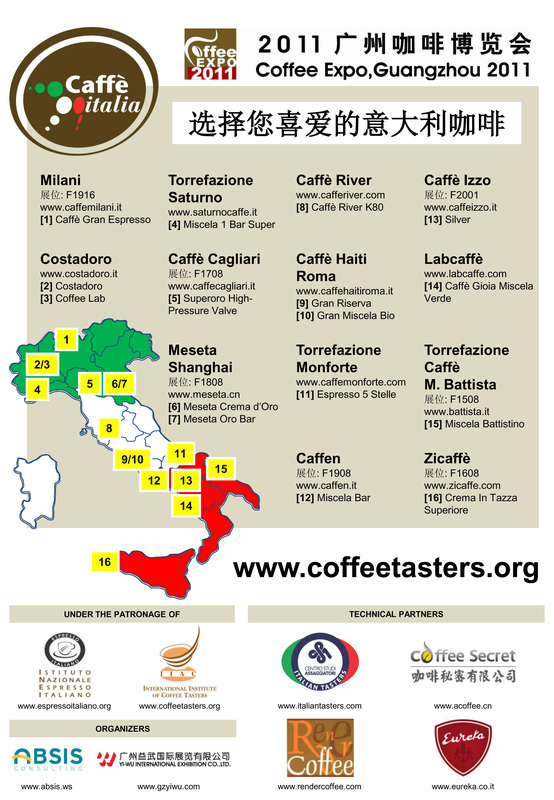 From 24th to 27th of November a Caffè Italia strengthen by the presence of 16 different blends will enter the scene during the Guangzhou Coffee Expo 2011. 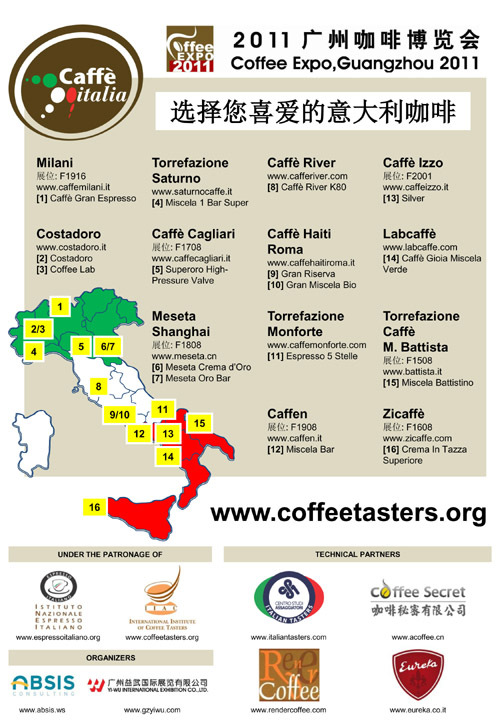 A tasting point proposing the Iespresso in its regional variations to the Chinese public, ranging from the region of Piedmont to Sicily. There is just one idea in mind: to continue spreading our espresso principles in China. What is the most challenging thing of this new Chinese episode? The fact that Caffè Italia knew how to capture the attention of more roasters, a lot of which will be present in the area (if you are curious to know who they are, I redirect you to the coffee list that follows). The journey of our espresso in China is rather long but meanwhile we are making our way, and we sincerely thank those who are supporting us. The world of coffee shops in Italy is afflicted by a widespread lack of planning. A small number of coffee shop owners know their business and are able to plan and are joined by hordes of operators living hand to mouth. Although outside Italy the situation is not always at its best, it really depends on the country taken into account, you generally meet sharper operators who think in real terms of marketing. GREENTREECaffè is one of these cases. Vittorio Ventura and Dana Hruba have created a chain of coffee shops in Bratislava; to be precise, five coffee shops in only two and a half years, in a very competitive market such as Bratislava. The Slovakian capital has only half a million inhabitants but is a remarkable tourist crossroads surrounded by Vienna, Prague and Budapest. This is why at least two other chains other than GREENTREECaffè exist, everyday playing “the coffee battle” in the city. It is obvious that the staff at GREENTREECaffè plays on Italian espresso and related products. GREENTREECaffè is now the first Permanent Training Point of the International Institute of Coffee Tasters in Central Europe. The coffee shop in Venturska, with a splendid room with hundred-year-old vaults, within the last few days has entered into the International Institute of Coffee Taster’s network, bringing the number of the Permanent Training Points to 28 (four of which are outside of Italy: Stuttgart, Dneperpetrovsk, Tokyo and now Bratislava). To inaugurate the Institute new embassy, on Saturday 5th November a Espresso Italiano Tasting course was held to license new coffee tasters, which followed the course held last year by GREENTREECaffè. 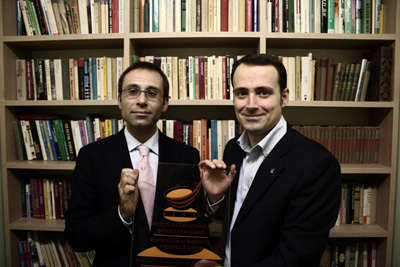 Vittorio Ventura receives the plaque for the GREENTREECaffè’s new Permanent Training Point in Bratislava. Photos of the new PTP are available on our Facebook page. What’s the state of art of the coffee market in the UK? 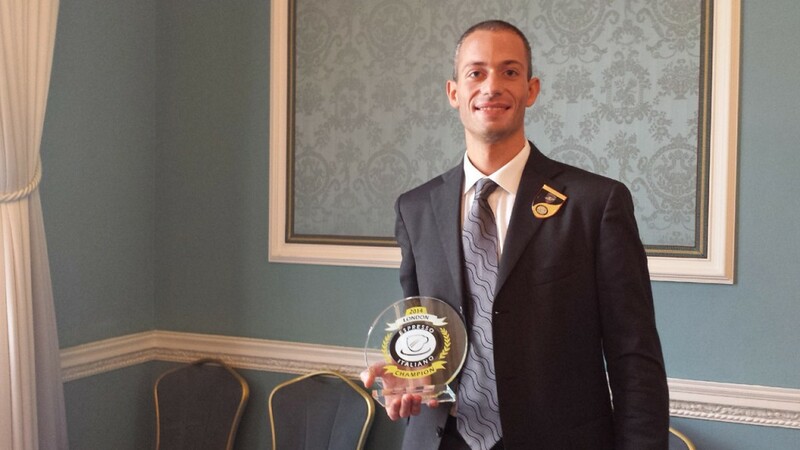 We interviewed Simon Speed Andrews, Head of Training of Miko Coffee. What’s the situation of the coffee market in the UK? The coffee market is not precise, we have always been led by the culture of Italy, but serve what is more akin to America with a new lead from Australia and NL. The ‘Starbucks’ phenomenon in the early 90’s has capitulated the spread and expansion of the coffee shop. The problem lies with the fact that we drink milky style drinks and the coffee has not always been the main criteria for good coffee. The culture is now changing and the customer is seeking good quality coffee and the espresso element is becoming very important. What is the general culture about espresso in the UK? Espresso Culture per se is not evident, however this I think is in part due to the ‘Starbucks’ phenomenon, again with the high level of antipodeans arriving and working in the coffee industry this has changed the outlook for more artisan roasted quality blends and the focus is on the espresso but regrettably still more single origin 100% Arabica coffees rather than good blends. What is the future of the espresso market in the UK and what do you think should be done? The future for the espresso is very positive, however to change the culture we need to focus more on the espresso and educate not only the coffee companies but also the general public, in terms of the benefits of a quality blend and how to prepare correctly the espresso. Unfortunately little care is given to the beans by the coffee house or those that serve it and a lack of knowledge in how to prepare good espresso has led to what I can only describe, as at best a mediocre experience, to at worst nothing more than a flavourless poor experience.